Background: Information on the bioavailability of the essential mineral Mg2+ is sparse. Objective/Method: Evaluation of the present knowledge on factors influencing the bioavailability and intestinal absorption of Mg2+. Results: Mg2+ is absorbed via a paracellular passive and a transcellular active pathway that involves TRPM6/7 channel proteins. The bioavailability of Mg2+ varies within a broad range, depending on the dose, the food matrix, and enhancing and inhibiting factors. 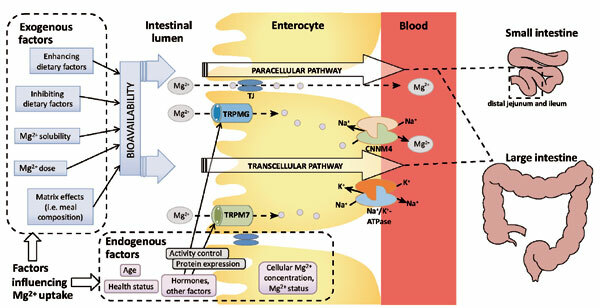 Dietary factors impairing Mg2+ uptake include high doses of other minerals, partly fermentable fibres (e.g., hemicellulose), non-fermentable fibres (e.g., cellulose, lignin), phytate and oxalate, whereas proteins, medium- chain-triglycerides, and low- or indigestible carbohydrates (e.g., resistant starch, oligosaccharides, inulin, mannitol and lactulose) enhance Mg2+ uptake. The Mg2+ dose is a major factor controlling the amount of Mg2+ absorbed. In principle, the relative Mg2+ uptake is higher when the mineral is ingested in multiple low doses throughout the day compared to a single, large intake of Mg2+. The type of Mg2+ salt appears less relevant than is often thought. Some studies demonstrated a slightly higher bioavailability of organic Mg2+ salts compared to inorganic compounds under standardized conditions, whereas other studies did not. Conclusion: Due to the lack of standardized tests to assess Mg2+ status and intestinal absorption, it remains unclear which Mg2+ binding form produces the highest bioavailability. The Mg2+ intake dose combined with the endogenous Mg2+ status is more important. Because Mg2+ cannot be stored but only retained for current needs, a higher absorption is usually followed by a higher excretion of the mineral. Background: Many multiprocessor systems have interconnection networks as underlying topologies, also described in various patents, and an interconnection network is usually represented by a graph where nodes represent processors and links represent communication links between processors. For the system, study of the topological properties of its interconnection network is important. In 2012, Peng et al. proposed a new measure for fault diagnosis of the system, namely, the g-goodneighbor diagnosability (which is also called the g-good-neighbor conditional diagnosability), which requires that every fault-free node contains at least g fault-free neighbors. The n-dimensional alternating group graph network ANn has been proved to be an important viable candidate for interconnecting a multiprocessor system. The feature of ANn includes low degree of node, small diameter, symmetry, and high degree of fault-tolerance. Results: In this paper, we prove that the 1-good-neighbor diagnosability (which is also called the nature diagnosability) of ANn is 2n-4 for n >5 under the PMC model and MM* model, the nature diagnosability of 4-dimensional alternating group graph network AN4 under the PMC is 4 and the nature diagnosability of AN4 under the MM* model is 3. Conclusion: In this paper, we investigate the problem of the nature diagnosability of AN4 under the PMC model and MM* model. It is proved that the nature diagnosability of ANn under the PMC model and MM* model is 2n-4 when n >5. The above results show that the nature diagnosability is several times larger than the classical diagnosability of ANn depending on the condition: 1-good-neighbors. The work will help engineers to develop more different measures of the nature diagnosability based on application environment, network topology, network reliability, and statistics related to fault patterns. SMI EVENT – 6TH ANNUAL ANTIBODIES & ANTIBODY DRUG CONJUGATES CONFERENCE! SMi is proud to present their 6th annual Antibodies and Antibody Drug Conjugates conference on the 9th-10th of April 2018. Antibodies and antibody drug conjugates (ADCs) have the potential to make a groundbreaking impact upon medicinal therapies, diagnostics and characterization of diseases. There is massive potential for ADCs to be used in the development of targeted solid tumour therapies, due to their ability to act as precisely and effectively on target antigens. Key topics that will be covered in the upcoming event include: fragment drug conjugates, ADC payloads, site-selective ADCs/ site-specific conjugation and the best linker and warhead combinations. TESTIMONIAL BY LEE SUAN CHUA!